These patterns are created in PDF format. PDF patterns are easy to use. There is no software installation necessary.You can save the pattern PDFs to your computer, print out, assemble pattern pieces and use the patterns to cut and sew our lovely designs. The sizing is according to our sizing chart. 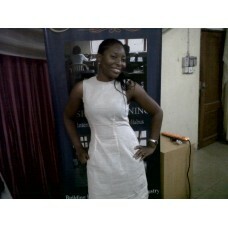 When choose sizes for bodice garments like tops, blouses, dresses, jackets etc, choose using the bust sizing. When choosing skirts and trousers, choose using the hip measurements. When choosing a jacket for example and your bust is 38 inches while your hip is 46, it is easier to increase the hip measurement. When choosing a skirt pattern and your hip is 46 and waist is 32, it is easier to fit in the waist line. Measure skirt and dress lengths to adjust to required length.The finished garment will have a little more added for a comfortable fit. This pattern comes in three sizes: 6, 8,and 10. You can opt to download the PDF pattern file and pri..
Denim and ankara mix dress. This dress can be made in several fabric combinations. .. Dress with assymetrical drapes on the waistline. Excellent fitPDF pattern.Standard sizesAfter purch..
Fitted dress with a low back. ..
Are you tired of taking several long minutes to cut a shirt or shirt patterns that don't fit? Now yo..
Easy fitting palazzo pants. They are cut wide in the leg. Very flattering in soft fabric. You can cu..
Jumpsuit with optional collar. Long sleeves can be adapted to style. Wide straight legs. Waist cut. ..